PUNE: A noted vocalist from Pune, Pandit Suhas Vyas, is all set to enthral the audience at the 'BRICS Vocal Concert' at Xiamen in China next week, through his Hindustani classical renditions. The 68-year-old artist will perform at Xiamen Artistic Theatre in China on September 16 as a part of the 'BRICS Cultural Festival', to be organised from September 15 and 22. The festival was formally inaugurated during the BRICS Summit, held in the coastal city of China earlier this week. "I have been a panel member of the Indian Council for Cultural Relations (ICCR) for the last several years. It is the ICCR, which invited me to perform on such a prestigious platform, where diplomats, ambassadors and political leaders from the BRICS nations will be present," Vyas said. "Getting an opportunity to showcase the Indian classical music on such a prestigious platform in itself is a great honour...Not just for me, but for the entire musical fraternity in India," he said. Vyas said at the event, he will present a composition "Jai jai Bharat desh hamara, naman pratham karu mangal gaau" in 'Yaman' raga. "Besides this patriotic classical rendition, which was composed by Dr S N Ratanjankar, I will also present three bhajans (devotional songs)," He said. Vyas will be accompanied by Mahesh Kanole (on tabla), Shrinivas Acharya (on harmonium) and his son Aditya Vyas (vocal support). 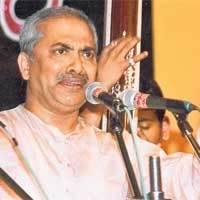 Born on October 26, 1949 in Osmanabad in Maharashtra, Vyas started imbibing musical values and training at a very tender age under the tutelage of his father renowned vocalist Padmabhushan Pandit C R Vyas. Although Suhas Vyas belongs to the traditional discipline of three different gharanas-- Gwalior, Agra, and Kirana-- he has his distinctively individual style. He been performing on prestigious platforms all over the country and abroad and promoting the cause of Indian classical music by training several students and conducting lectures and demonstrations both, in India and abroad. Artists from other BRICS countries are set to perform at the festival.